The graphic novel Paradise Suite retells the biblical Genesis story. Adam and Eve have difficulty comprehending the Garden of Paradise’s narcissistic rules. A fierce sexual desire awakens between them at the same time God grows possessive in his love. God ends up having a bad day and destroying the garden. The difference between love and possession remains ambiguous – to God as well. Eve refuses to repent eating the apple, while Adam regrets her move and fears God’s wrath. In Paradise Suite Adam and Eve are thrown into baffling situations in which they find it impossible to live up to God’s expectations. Paradise Suite describes the complex relationship between man, woman and God in a new thought provoking take on the origin of humans. 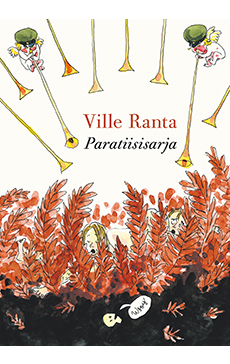 It is Ranta’s seventh graphic novel.